Chris Giles is specified as the websites creator. three profiles were found for Chrisgilesphotography.co.uk in social networks. Among other social networks the website is represented in Facebook, Twitter and GooglePlus. The web server used by Chrisgilesphotography.co.uk is located in Great Britain and run by Heart Internet Ltd. There are many websites run by this web server. The operator uses this server for many hosting clients. In total there are at least 201 websites on this server. The language of these websites is mostly english. 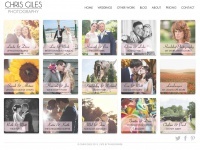 The websites of Chrisgilesphotography.co.uk are served by a Apache server. The markup language of the website is XHTML 1.0 Strict. The visitor analysis software Google Analytics is used to analyze the visitors of the websites.